Since 1984 Phyllis Capello has been a teaching poet-in-residence with Poets in Public Service, Arts Partners, The Children's Museum of Manhattan, The New York City Ballet School of Education and Teachers & Writers Collaborative. In 1991 she joined the circus--The Big Apple Circus Clown Care Unit-- as "Dr." Ukulele Lady, troubadour/clown, she's one of the performers who bring the joy and excitement of classical circus to the bedsides of hospitalized children all year 'round. In 1992 she received a fiction fellowship from The New York Foundation for the Arts. In 1997 she was a finalist for the Lullwater Fiction Prize and a contributor to "VIA's (Voices in Italian Americana) Special Issue on Italian American Women Writers. Last May her one-woman show: Careless Love: Rescued by the Blues was staged at New York City's The Kitchen. In '96 she was a prize winner in the Allen Ginsberg Poetry Awards. 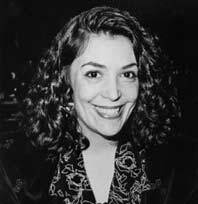 In '95 her poetry appeared in Journey Into Motherhood, Riverhead/Putnam. Her prize-winning story, An Angel By & By, was published in: The Voices We Carry," Guernica Press, 1994; that year she enjoyed a residency at the Byrdcliffe Arts Colony. In 1993 her story, Way Home, was a semi-finalist in the PEN National Syndicated Fiction Prize. Her poetry appeared in the 1985 prize-winning anthology, "The Dream Book, Writings by Italian American Women Writers," soon to be reissued by the Feminist Press. As Ukulele Lady, she performs at schools, institutions and festivals. For the last four summers she's taught and entertained on European family cruises in Italy, Greece, Turkey, The British Isles, Ireland and the Baltic. In 1997 her storytelling programs helped the Brooklyn Museum of Art celebrate Welcome Back to Brooklyn Day and its Centennial Gala. She's performed for the Brooklyn Arts Council, The Whitney Museum of Art, The Staten Island Children's Museum, The Toyota Comedy Festival, Prospect Park and Hempstead Children's Summer Festival. She's taught poetry, teacher and intergenerational workshops for The Children's Museum of Manhattan and "Swingin' On a Star," a Parent/Child music program. In 1996 she opened their Little Folk concerts.